Himalayan Salt Cabin at Carson Aesthetics. Enter your own paradise with our Private Infrared Himalayan Salt Sauna! By gently heating the Himalayan salt, the moisture-attracting properties of the salt are activated, allowing the natural humidity in the air to condense on the surface of the salt blocks, triggering the natural ionization process. During this process, the salt releases negative ions that in turn attach themselves to dust, bacteria, and other pollutants, effectively purifying the circulating air. Salt Therapy is a safe and effective way of using salt’s natural antibacterial, anti-inflammatory and super absorbent properties to provide relief for respiratory and skin conditions. 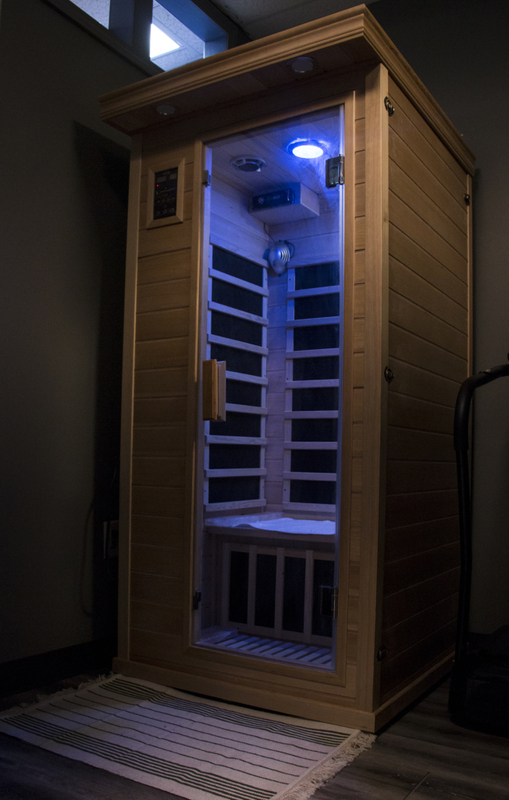 Infrared saunas are able to penetrate far deeper into the skin than traditional saunas, allowing you to sweat out more toxins, ease tired muscles and sore joints better, also help with a plethora of ailments, including aiding those that are going through chemotherapy for cancer treatment. These rays leave you feeling renewed and re-energized. When you heat salt, it becomes super dry and kinetically more active. This heated and dry pure sodium chloride is then crushed into micro-sized particles and dispersed into the air in an environment where you are inhaling the fresh salt air. When micro-particles of dry salt is inhaled into the respiratory system, it does its job by absorbing and removing all the allergens, toxins and foreign substances in your lungs and throughout your respiratory tract. Salt also reduces any inflammation and opens airway passages. The Himalayan Salt Sauna releases negatively charged ions which serve to purify the circulating air as well as allow our bodies to reap health benefits including stress reduction, energy increases, and mood boosts at a biochemical level. Containing at least 84 naturally occurring trace elements in their natural mineral form, the benefits of Halotherapy (the inhalation of micronized dry salt within a chamber) are abundant. When the effect of pure Himalayan salt is added to Infrared Sauna, the result is a truly superior sauna experience. Book Your Himalayan Salt Sauna Session Today!